Nowadays, it’s nearly impossible to go a full workday without screen time. For many millennials and other young adults, it’s an essential part of the daily work world. A recent survey found that full-time workers and Gen Yers spend an average of eight hours per day looking at a screen. This can result in strained, sore, and dry eyes. So what do you do when you have to stare at a screen all day as part of your job, but want to protect your eyes? Here are a few simple tips and tricks to help you save your eyesight. Follow The 20-20-20 Rule: One simple trick you can use to help save your eyesight is to follow the simple 20-20-20 rule. For every 20 minutes that you’re looking at a screen, look at something 20 feet away for at least 20 seconds. This will give your eyes a chance to relax from the strain of looking at the screen. Adjust Your Display: Most tablets, phones, and screens nowadays have a wide variety of display options to help reduce eye strain from frequent use. If possible, use a blue light filter, or adjust the color temperature on your device to use warmer colors. This reduces the amount of blue light your screen is emitting, which can prevent overall eye strain from long-term use. Get Computer Lenses: Several companies have begun creating specialized computer glasses. These unique lenses are designed to reduce glare on screens, making text easier to read and overall decreasing eye strain. Additionally, many of these lenses will have a red, yellow, or orange tint to them, changing the blue light often emitted by tablets, phones, and computers to less harmful warmer tones. 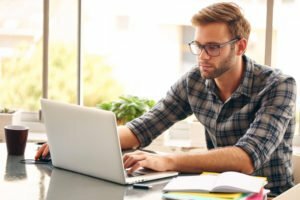 Purchasing a pair of computer glasses, especially for people who spend a large amount of time working on computers, can be incredibly helpful when it comes to reducing the impact of technology on your vision. Do you spend all day looking at screens as part of your job? How do you plan to protect your eyesight from screens?